They won’t stop talking. They go on and on about their day, family, dog, cat and any other subject that crosses their addled minds. They just won’t shut up. What you need to do is give them something to keep that wagging tongue busy. That’s where I Love The Sound You Make When You Shut Up Mints come into play. The blissful sound of silence as they button their lips long enough to freshen their breath will give you the same delightful feeling you had as a child waking up on Christmas morning. One of the worst traits of endless talkers is that their breath often smells. When you’re passing enough hot air between your lips to fill a Thanksgiving parade float, it’s going to start stinking. This is especially true post lunch or dinner when rogue garlic and onions invade your nostrils as they chatter about a recent episode of some show you don’t even watch. 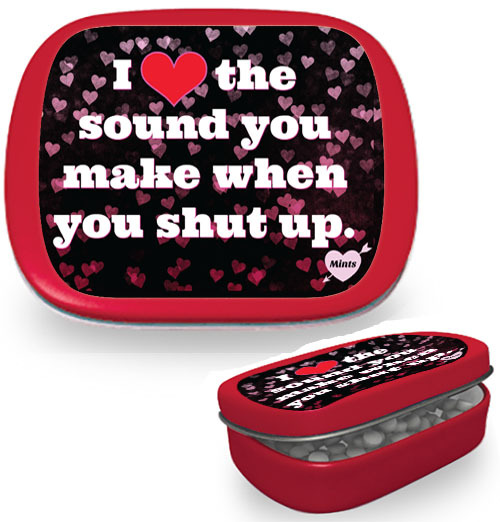 Freshen that awful breath with I Love The Sound You Make When You Shut Up Mints. Save your sanity one mint at a time.